Panasonic unveiled their much awaited S1 and S1R mirrorless full-frame cameras in India recently under the banner of ‘Futurography’. The S1R features a 47-megapixel sensor whereas the S1 features a 26-megapixel. The cameras are priced at 2.99 lac (body only) and 1.99 lac (body only) are the company’s foray into the full frame mirrorless market, aimed at the professional photographers looking to push the boundaries in the full frame segment. The 3 biggest plays that the manufacturer is banking on is the ‘Pixel Shift’ technology, 4K with 60p and also new M mount, which with the help of the Sigma adapter allows users to use any lens on the cameras. ‘We’ve been waiting to launch a product like this’ said Manish Sharma, President and CEO, Panasonic India & South Asia. The S1R is aimed at the professional with a 47-megapixel camera while the S1 is aimed at the more affordable range. In terms of video both cameras shoot 4K and offer frame rates of up to 60 FPS. And that seems good considering that both offer Dual Stabilization, in-body as well as lens. And also the camera features the highest resolution EVF in the industry currently, giving a resolution of 5.7 million dots at the refresh rate of 120 FPS. The new cameras also come along with the new M mount lenses that are jointly developed with Leica and Sigma. 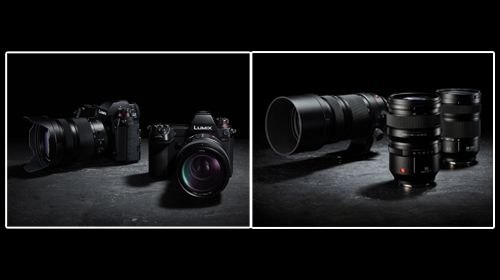 Along with the cameras Panasonic debuted the 50 mm F/1.4, the 70-200mm F4 with OIS and also the 24-105 mm F4 Macro with OIS. Over time the M mount is expected to universally allow users to use other manufactures lenses on the Panasonic bodies.